Vinayaga chathurthi is a Hindu festival celebrating the birth of lord vinayagar. He is widely worshipped as the god of wisdom, prosperity and good fortune. 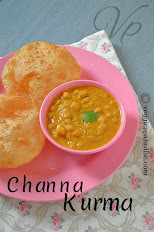 During his birthday Modakam and chana dal sundal is prepared as prasadams. Wash and soak channa dal in water for about 30 minutes. Pressure cook the dal until soft. Drain the excess water and mash the dal. Now melt the jaggery in little water ,when it gets dissolved remove from heat and filter it. Heat up a heavy bottomed pan, add the filtered jaggery and mashed channa dal, stir it until the mixture thickens slightly. Finally add the grated coconut, cardamom and stir it gently for a couple of minutes or until it blends well. Sweet filling is ready , make equal sized ball out of it and keep it aside. Now let us start with the outer covering. Boil water along with salt and oil . Remove from heat. Now add the boiled water to the rice flour, little by little and keep stirring. ( The water quantity depends on the quality of the rice flour. So for 1 cup of flour use one and half cup of water and then if needed add more water. Once the mixture turns little thick , knead it well to form a soft dough,neither too dry or sticky. Kozhukattai's can be prepared in different shapes , crescent shape which is flat and horizontal , round shape which is the most comfortable, easy way and the final shape is the modakam in vertical shape. 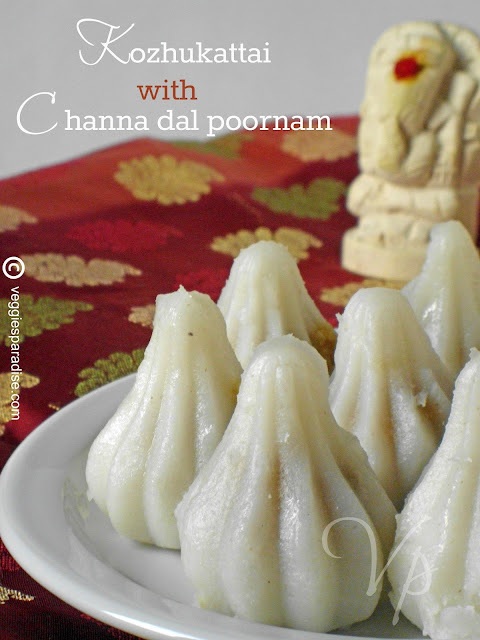 I have used ready made mould to shape my kozhukattai's in vertical shape.Grease the mould with little oil, take a lemon sized ball and spread it inside the mould gently,leaving space in the center for the filling.Now keep the poornam ball inside and seal the base with the dough.Finish all the dough and pooranam like above. Alternative method - with no mould - Grease your palms with little oil and take a ball made from the dough. Now using your thumb form a small depression and continue pressing to form a pocket shaped one. Place the poornam inside,bring the edges together and seal the edges using a gentle pressure. Conitunue the same with the rest of the dough and poornam. Place them in an idly plate and steam cook it for about 5-10 minutes or until done. Remove them gently. Wow these modaks are so well done. Perfect for Ganesh Chaturthi. 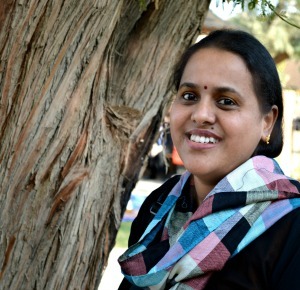 Aruna,those kozhukattais look so perfect with clean lines. Really inviting!!! 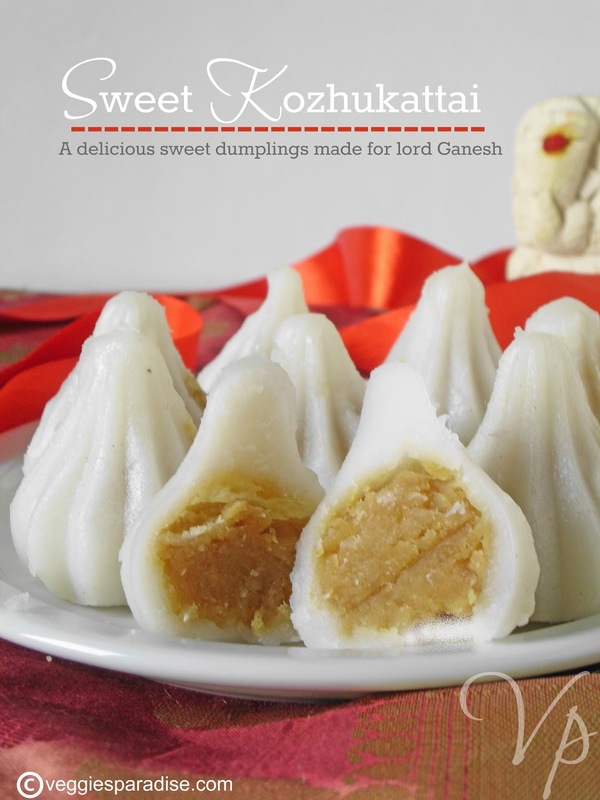 Perfectly done modak,happy Vinayagar chathurthi to u n ur family dear!!! wow! what a shape! looks yum. I always love these pretty modakams made with the press. I have to buy one too!